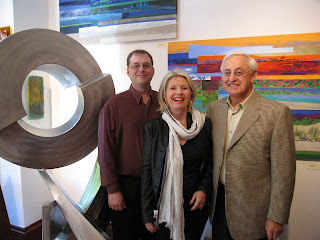 Rob Lorenson, gallery client Barbara Ottmar and Bob Cipriani at the opening of our "Arcs and Angles" show. 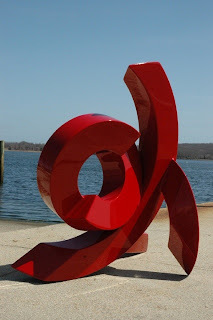 We are readying the gallery for our next show "Arcs and Angles" featuring the dynamic sculptures of Rob Lorenson and the exciting paintings of Bob Cipriani. The walls are being painted and the new works are being moved into place. We hope you will join us on May 17th from 4-7 pm (218 Newbury Street in Boston) for our opening reception. Rob Lorenson and Bob Cipriani will both be there to talk about their work. We'll have wine, cheese and crab dip to entertain your palate, and new artworks to entertain your eye. Above: "Scorpion" by Rob Lorenson. Below: "Passages 8, Southern Exposure" by Bob Cipriani. For more photos of each artist's work, please click here. 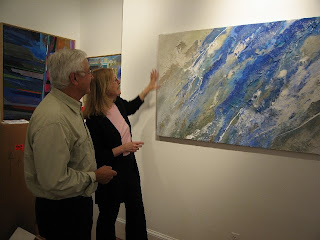 Bob Cipriani and gallery owner, Betty Bothereau, stand back after hanging Bob's mixed media piece entitled "Sea Glass Islands in the Stream 5". 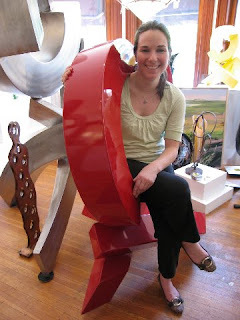 L'Attitude Gallery art consultant, Caroline Dobrowski, takes a break between installations. With warm weather finally upon us, it’s time to brighten up the home. What better way to do it than with fabulous new art? Need inspiration? Come check out the 2008 Dream Home at the Boston Design Center. Nine of the area’s top designers have created beautiful rooms to suit any style and taste. Each designer has successfully incorporated artwork -- some of which comes from us! It not only adds vibrant pops of color but also aides in setting the tone of each room. After viewing the Dream Home, come visit us at our newest location on the 5th floor - Suite 541. Our consultants can help you find the perfect piece of art on any budget to help add energy to an old room, or to create the right feeling in a new one. We have a great selection of reasonably priced Mother's Day gifts. 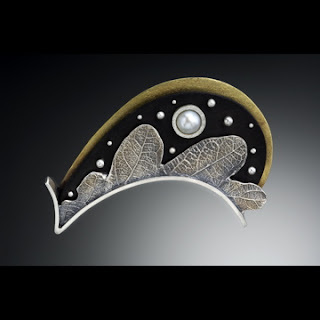 Stop by 218 Newbury Street to see our jewelry, glass works, small scale wire sculptures, vases and paper pulp "paintings". 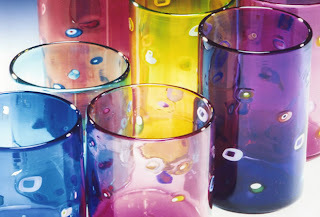 Peter Ridabock's blown glass "Barnacle Tumblers". 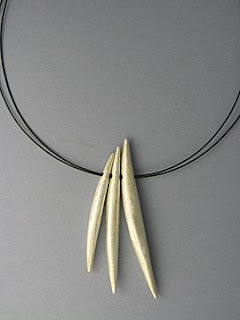 "Silver Pod Necklace" (below) by Suzanne Linquist. 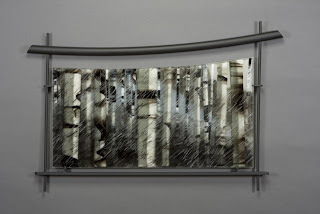 "Moon over White Mountain" is Roger Thomas' stunning new fused glass wall piece. 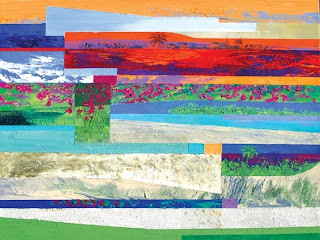 Roger creates his compositions using glass elements that he carefully cuts, arranges and layers. The piece is then fired (sometimes several times) at very high temperatures. You really have to see one of Roger's pieces to understand this dramatic medium. The simple but classic iron frame (which Roger also designs) holds the glass in place and enhances its drama. Size is 51" w x 33" h x 2" d including frame.